This is the cover for this year's Rhyme Rag. Thanks a bunch to BRENB for the help with the textures! The illustration is completely done in Painter with a tiny bit of retouching in Photoshop. I didn't even do a sketch in paper. I had a very clear idea of what I wanted, started on a blank file in Painter, sketching with the pencils tools. when I was totally happy with the composition I started collecting all the images (fountain pen, wings, splatters...) and then started drawing with the scraperboard tool. 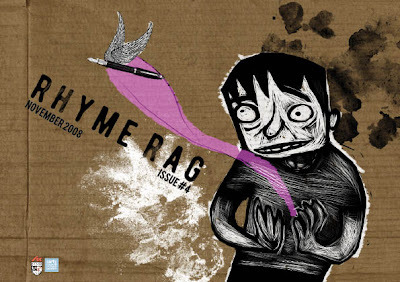 The launch of the Rhyme Rag is next Wednesday 15th November in the Arts Office Kilkenny County Council. It is always a great night and the buzz is unbelievable so please make the effort to come! Posted by Alé Mercado at 12:37 p.m.
as usual i love it! And the textures are really cool aswell. lookin cool. send me one of them will ya?